During a conversation, I was told about this unbelievable service that allowed you to see as many movies as you’d like for one flat fee. As an avid moviegoer, I had to investigate to see if I could save some money and possibly see more movies. 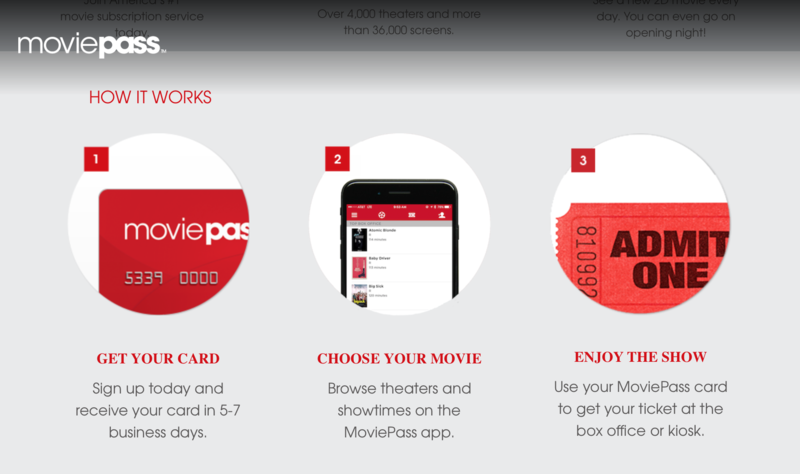 MoviePass is a subscription service that allows subscribers to see on 2D film in theaters once a day for $9.95/month, with no blackout dates at pretty much every theater imaginable, even small indies. Once subscribed, a MoviePass debit card is sent to purchase tickets with, this takes about a week or two. Also, you must have the MoviePass app downloaded on your phone to be able to check into movies. I’ve had the service for about three weeks and so far, for me at least, it is completely worth it. Since my card has been delivered I’ve seen three films, two of which I saw within the same week. Before I signed up, I would go to the theater once a week, typically on discounted Tuesdays. On average I was spending around $20-$30 a month going to the movies. That is excluding concessions, which I probably spent another $30 a month on. I’ve found that I’m actually spending more on concessions than before. In some psychological trick, I’ve convinced myself that since I’m not paying full price for tickets I can splurge on popcorn. For less than one movie ticket, I was getting three tickets. Just by seeing one movie a month, I was breaking even, one ticket at my local theater ranged around $10.50 for a weekday. Around the same price as Netflix, MoviePass seems like an unbeatable deal for those who love the movie-going experience. I will say there are some drawbacks. A major one for me would be that you have to be within 100 yards of the theater to check-in to a movie, which does not allow for you to purchase your seats ahead of time. So, if I wanted to catch a busy weekend movie I’d have to go to the theater earlier and purchase my ticket in person. Another one being that it’s only for 2D films, which shouldn’t be that big of a deal, but at my local theater every blockbuster is shown in every other type of viewing experience except 2D, so sometimes it bums me out if the only good times are 3D. It also doesn’t give you an option to pay extra to upgrade in theaters or on the app. Regardless, I would definitely recommend MoviePass. I basically have already told every single person I know, just to get more people out to theaters, but what I’ve been told is that many people don’t go more than once a month. Hopefully, MoviePass, along with other theater subscription services such as Sinema and or Cinemark’s Movie Club, will change that.